India have created history by beating Qatar, ranked 53 places higher, away from home at Al Sadd Stadium, Doha on Sunday evening in a practice match. The last time the Indian senior team won an international match away from home was back in 2004 against Kuwait with the scoreline reading 3-2 wherein Tomba Singh, Jerry Zirzanga and Abhishek Yadav were the scorers. Armando Colaco seems to have got the right mix as he has led India to a victory over a much stronger opponent which shall definitely boost the team’s confidence going into the 2014 World Cup Qualifiers against UAE. The Dempo coach made one change in the line-up from the match against Maldives as he started with Lalrindika Ralte on the right wing in place of Steven Dias. Mehtab Hussain and Climax Lawrence were the two central midfielders while Jeje Lalpekhlua and Sunil Chhetri were the two strikers. Surprisingly, Qatar coach Milovan Rajevac left out their star midfielder Fabio Caesar, Sebastian Soria and Lawrence Quaye on the bench. 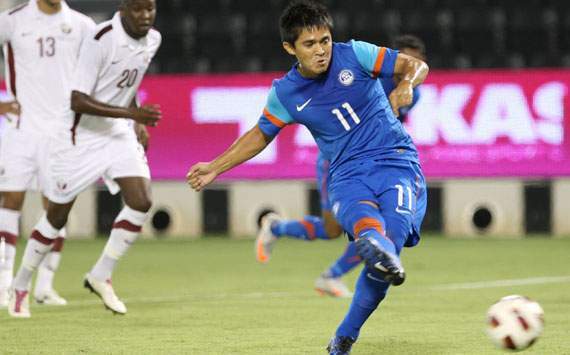 Just as in the previous match, India didn’t take long to open the scoring as Sunil Chhetri’s coolly taken penalty in the 16th minute saw them surge ahead after goalkeeper Baba Malick went the wrong way. This was after Debabrata Roy was brought down inside the box by Qatar skipper Bilal Mohamed after Climax Lawrence sent in a throughball for the full back to chase. India dominated the proceedings until the half hour mark and could have doubled the lead when Lalrindika Ralte unleashed a left footer which just about sailed over the bar after a quick one-two with Chhetri. Qatar looked to get back into the match thereafter but their efforts failed to bore any fruits in the first half with the scoreline being in favour of the visitors. Colaco, in his attempt to use as many players ahead of the 2014 World Cup Qualifiers against UAE, went on to change as many as 10 players with only Subrata Paul being the constant from the team that started. Jewel Raja, Mahesh Gawli, Valeriano Rebello, Baljit Sahni, Sushil Kumar, Clifford Miranda, Peter Carvalho, Rowilson Rodrigues, Robert L and Harmanjot Khabra made their way in. It was in the 73rd minute that India did eventually manage to double their lead when Baljit Sahni’s assist saw Sushil Kumar complete the move with a neat placement after Harmanjot Khabra did well to cross from the left. Qatar did manage to pull one back through Muhammed Razzark in the very next minute from a long range effort. While Qatar were left to brood over the defeat, it is certainly a proud moment for India as they surprised the West Asian nation with a shock win.